Samo/Farali Dhokla also called as moraiyo in hindi is one of the item that is eaten during the fast or vrat in India. 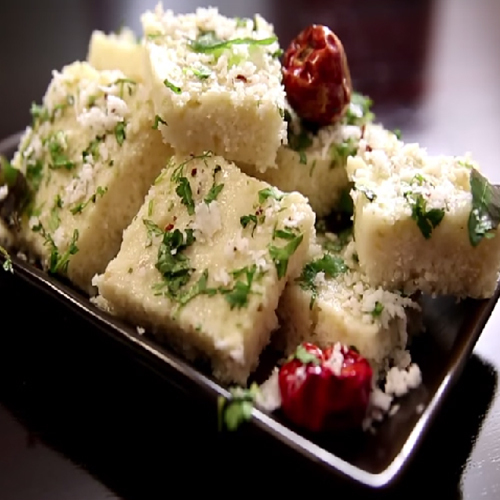 Farali dhokla is a delicious variation to popular gujarati snack Dhokla. Soak samo in curd for about 1 hour. Make sure samo is soaked properly, add little water if required to make a thick batter. After 1 hour grind samo and make a smooth batter to a thick consistency like idli or dhokla batter. Keep it for 6-8 hours for fermentation. Before preparing dhokla, add salt, ginger chilli paste, grated bottle gourd and eno. Mix all together well. Pour this batter to a greased steamer vessel/pan. Sprinkle pepper powder on it and put it in a steamer.Â Cover the lid without pressure valve and steam cook for about 12-15 mins.Â Allow to cool and cut into square. Sprinkle over chopped coriander for garnishing. Farali Dhokla is ready to serve. Serve it with green chutney.